You are cordially invited to the painting exposition of Groupe M and the sculptures of special invited artist, Svetla Velikova at the Gallery Espace. 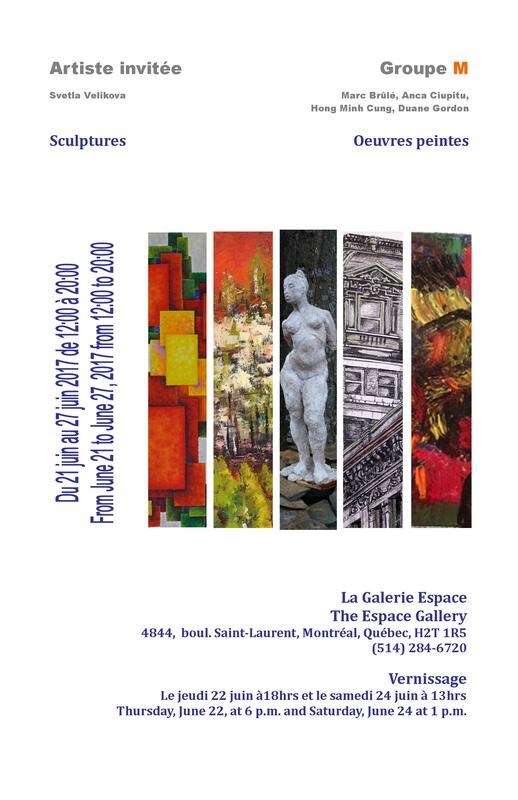 Groupe M is presenting at the Gallery Espace on Saint-Laurent Boulevard from 21 to the 27 June 2016. The Group M artists’ collective, Marc Brûlé, Anca Ciupitu, Hong Minh Cung and Duane Gordon, has worked together for several years and represents a true reflection of Montreal’s multicultural landscape. Drawn together by their love of art and inspired by their personal interpretation of their shared experience of the world around them, each member expresses his or her unique creative vision. This exhibition underlines the diversity of their artistic practices and approaches through contemporary mixed works of art. The vernissage will be June 22 at 5:00 PM. The artists will also be present to meet you at an informal Saturday afternoon gathering, June 24 at 3:00 PM. The exposition is open to the public every day from 12 noon to 8:00 PM. I hope you’ll join us on Thursday evening or on Saturday afternoon. Come see our latest paintings and join us for a glass of wine. This entry was posted in News on November 2, 2014 by Kelly. When We Play is a non-profit organization helping build stronger communities by offering accessible arts education. As a volunteer with When We Play, I help create and lead programs and workshops that nurture minds through the arts, fostering academic achievement and personal growth in youth by improving confidence, focus and social skills. Creativity and imagination are among our greatest gifts. Though art is available in schools, our education system focuses more on performance, and hence children who struggle academically have fewer opportunities to explore their creativity. In school, art can become one more challenge, one more potential failure, but when children explore creativity outside of school, the arts can provide one of the few places these children will experience success. I draw with pencil, for only pencil perfectly captures the quality of line and value in portraying my urban compositions. My deep passion for and years of experience drawing make composition intuitive and instantaneous. I paint with oils, for oil alone has a transparent quality that allows the painted light and shadow to shift as if the sun was moving across the substitute sky. I drew as soon as I could hold a pencil, but I added colour to my work only later in my art career. I took up oil painting because, in my mind, it was the most “serious” medium. It was only with experience I discovered oil was indeed the only way to achieve the effects of transparency and blending essential to express my style. For several years, I experimented with various media and supports until I discovered a technique that would allow me to combine pencil drawing and oil painting together on stone “paper.” Stone paper is a paper-like product manufactured from calcium carbonate bonded with high-density polyethylene (HDPE). It is environmentally friendly, an extremely smooth surface perfect for my detailed drawings but also an excellent support for oil painting. I find it also appropriate that my architectural portraits are captured on a stone surface. This entry was posted in Articles, The Stories Behind the Art on October 27, 2014 by Kelly. Creativity is a fast, and slow, process. How can it be both? Inspiration hits in an instant… I see something that sparks a rush of possibilities. Ideas flood my brain, each more exciting than the last. What provides the spark? In my case, it’s often a glimpse of an architectural detail. Found a particular spot in one station where as a ascend from the depths (it’s a very deep station!) there’s a spot where the ceiling’s concrete beams, walls, supports and platforms form an amazing composition of lines, planes, shadows and light. Discovered that through a particular window of the metro station, at just the right time of the morning, the sun rises and illuminates the old wall of an abandoned building, providing the perfect screen for the projections of the bare branches of a tree casting shadow puppets against the warm glow of the orange walls. Been captivated by an immense Iconic column supporting the station roof that riders circle as we exit the train and move up to the station doors. Right now, I’m thinking this image will become a triptych. Inspiration strikes like that… one moment its just another day, another ride on public transit… and the next it’s magical. Why so long? Observation and contemplation is essential between each step in the creative process. At each stage, the urge to create something new is almost overwhelming, but experience has taught me that I must respect my inspiration. When I’m inspired by a view, I already have the finished work pictured clearly in my mind. I know exactly what I want it to look like. But I forget. When I return to my studio, I spend hours sorting through photos, printing them out for display. Bulletin boards surround my desk; my studio wall is lined with cords with clothespins where I display the images. Works in various stages of completion are always within sight. Photographs are tacked up alongside drawings and color studies for my paintings. Even “finished” paintings are displayed for days and even weeks before I’m satisfied. At each stage of my creative process, I must reconnect with my original inspiration. I’m continually asking myself, “What is this about?” If the answer to that question changes, I won’t be happy with the resulting work. Every time I’ve allowed my work to veer off into another idea, I’ve been disappointed to learn I had it right the first time. My father’s career as a civil engineer exposed us to many different environments. As a child, I lived in remote mountain construction sites with no phone or television, in tiny villages like Wabamun, Alberta, small towns like Deer Lake, Newfoundland, and in cities like Halifax, Nova Scotia and La Paz, Bolivia. Today, I live in Montreal, Quebec. I’m very appreciative of nature’s beauty, but I have a definite bias toward the beauty people create as places to live, places to work, places to play. I love architecture. I continue to explore cities in search of inspiration in the beauty of a city’s buildings, vistas and skyline. A city’s personality is unique and it is reflected in the people and the architecture. Cities fascinate me, growing and evolving to follow the dreams and whims of the residents who come together in a shared experience. They take on a unique personality and thus attracting more people who share similar values and ambitions. This cycle ensures cities take on the personality of the people, and that people feel at home in their city. I love to explore cities like New York, Toronto and Montreal, walking through neighborhoods, my neck craning as I seek building facades, window hood molds, or cornices that catch my eye. I’m always looking for a unique angle, a flash of light or an interesting juxtaposition. I love discovering hidden gems like tiny historical stone buildings huddling between modern skyscrapers of glass and steel. It is these unexpected combinations that reveal the changing personality successive generations leave behind, layering architectural styles in a collage that slowly transforms to reflect the evolving lifestyles, preoccupations and priorities of its occupants. I appreciate the beauty, and admire the craftsmanship and artistry necessary to turn utilitarian shelter into a dazzling spectacle. Architectural creations typically outlive both builders and inhabitants, having a lasting influence on the neighborhood, the skyline and the lives around them. When I capture their legacy in my art, I feel that I am continuing their work, sharing the beauty they created and taking the influence of their efforts in a new direction, reaching new people. At our house, on the other hand, we remembered events according to where we were living when they happened. We moved often, so this provided a precise time-line to place events in context, except for my youngest sister, Melanie. Anything we spoke of she couldn’t remember, she relegated to ancient history saying, “That must have happened before I was born.” (She’s not as self-centered as that sounds!) Places naturally became placeholders for my memories. I’m almost as enthusiastic about plein-air painting as I am about camping! Linda Walker is my wife of almost 30 years (our 30th anniversary is coming up in May.) She’s always been very supportive of my art… in fact, it was she who insisted I return to creating art after abandoning my art for many years to turn my focus to achieving a more traditional definition of success (but that’s a different story.) You’ll have an opportunity to meet Linda in person at The Artist Project coming up in less than two weeks since she’ll be accompanying me and working with me at the show. As I mentioned, Linda always encourages my artistic pursuit but recently she put her foot down. When our family goes on vacation, Linda won’t let me handle the camera anymore. That’s a little embarrassing for an artist and photographer! It’s not what you think though. She’s not calling into question my photographic skills. She just complains, “We visit the most wonderful places and see amazing things. Then, when we get home, all I see are pictures of buildings!” Apparently, she finds the local people and their activities interesting as well, and wouldn’t mind having some photographs to help preserve memories of what she’s seen. Of course, I find those things interesting as well. I love travelling to new places and seeing interesting things. I’ve spent my life doing it, and it’s a habit that becomes deeply ingrained. However, photography is not a habit I developed. I’ve often wondered why people go on vacation and see everything only through the window of their camera lens. They wait until they return home to “experience” their vacation, second hand through their photos and videos. What was the point of the vacation at all… you can find photographs of just about anywhere you’d like to go at your local library or on the Internet. I’d rather “experience” a place while I’m there. I don’t collect photographs except in one case; it has always been my habit to go to the camera only when a scene inspires me as potential artwork. I hope you’ll drop by to see Linda and I and the art inspired by my explorations and what Linda finds are my endless collection of photographs of beautiful architecture and cityscapes. We’ll be at the Toronto Artist Project, Booth # 625, at the Better Living Centre in Toronto’s Exhibition Place February 21 to 24, 2014. Tickets are available at the door or click here to purchase in advance, but I have a number of complementary tickets I can share with my biggest fans. Contact me here. People often wonder why I focus my art on architecture, principally buildings and cityscapes. I’ve traveled the world and seen many of the natural wonders of the world. Take mountains, for example, a frequent choice of artists in search of an attractive subject. I’ve hiked in the Rocky Mountains, the Andes in South America and the Alps in Europe; there’s no question mountains are beautiful, breathtaking even, but they don’t appeal to me in the same way. I greatly admire urban architecture, the architecture of buildings and cities. I admire the talents of the people who conceive and build our cities. I’m endlessly fascinated by the way so many individual efforts come together to create buildings, neighborhoods and cites, each with a distinct air, a unique personality. I am not an architect, but I imagine architecture presents many of the same challenges art presents to the artist; create a thing of beauty within imposed constraints. Art always faces some constraint; the artist selects a medium, a format, an inspiration and so on. Painting representative art imposes even more constraints. When we, people, I mean, create buildings, we impose constraints of practicality; a building must serve the purpose of various activities while providing shelter from the elements. It must conform to the needs of the climate and the environment. It must accommodate the people who will work within it or around it. And while we’ve all seen buildings that conform only to practical constraints, when a buildings creators go beyond practicality to create something of beauty, that is when we really shine. And when we don’t, well, we’ve all seen buildings limited by the strict application of practical concerns; they’re rarely attractive. I find architecture reflects the personality of the people who create it more accurately than other means we use to express ourselves. Fashion trends come and go, car models change yearly. But buildings last longer; buildings take longer to build and endure longer even than the people who built them. Architecture reflects the true nature of the people inhabiting it. When I see a beautiful old building, I’m drawn to reflect on the skilled workers who participated in it’s construction. The architect, or course, but also surveyors, carpenters, masons, bricklayers, plumbers, electricians and more. And later, their work was honored by the owners and inhabitants, who took loving care of it, maintained or improved it. And nothing is more sad than to see a beautiful building neglected and left to ruin. When I choose a building, a group of buildings or a neighborhood, I connect with the architecture and through it, to the people who created, and who continue to create, the personality of the scene before me. I seek to create an image that will also pay homage to the skilled builders, the proud owners, the respectful inhabitants. Through the process of creating my image, I become intimately connected with that building, that scene. I make the building mine, and when I reveal my vision, I am inviting you, as an honored guest, to visit. And together we begin another chapter in the life of a building, of a neighborhood, of a city.